Essentially a summer jersey with long sleeves and increased protection from the wind, it is already a firm favourite. It is perfect for when you want to ride under the radar. This is it! The next generation, brand new successor to the legendary intermediate Evo long-sleeve jersey. Before intermediate, this type of cycling jersey simply did not exist. Very simple in concept, very effective on the bike: a summer jersey with long sleeves and airBlock front panel protection. Introducing the brand new intermediate_s7. Assos have elevated its performance, increased your comfort and lowered its volume. The intermediate_s7 provides superb total comfort and light protection when temperatures are a bit chilly but not too cold. Ideally suited for early morning rides or when riding in rapidly changing climatic conditions, as in MTB. 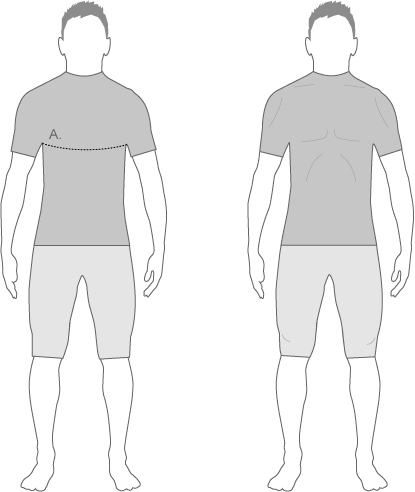 Always combine your intermediate with your ASSOS interactive body insulator as the first next-to-skin layer. ASSOS offers a specific interactive body insulator for each of our four climaRanges. You can extend the versatility of your intermediate_s7 equipment by combining it with a lighter or heavier interactive body insulator. The intermediate_s7 features six different textiles, 17 patterns and 14 components. Engineered following the ASSOS philosophy of cycling-specific body-mapping pattern design combined with the ASSOS AEPD know-how, it results in a high performance technical piece of body equipment. Frontpanel: new stratagonUltra airBlock fabric. Advantages: extreme stretch, extreme low volume and advanced breathability transmission factor. Side and rear panel made out of the new ASSOS Type.v X121 summer fabric as used on the new SS.Uno_s7. Advantage: Speed! 34% faster drying process compared to previous generation. This provides a better - operating body temperature regulation function. Upper arms feature a brand new, super light, fleecy type of insulation fabric. Nicely adhering, keeps your arms cozy and well protected and gives total freedom of movement. NEW: the front of the collar now features airBlock protection. Full zip with flap protection on the upper section. Three rear pockets, of which the center one is zippered and membrane-protected to give its contents light water protection. WristWrap: Better, more stable fit of the sleeves thanks to this new ASSOS construction feature. ASSOS Ergonomic Pattern Design - AEPD. Racing Cut. Pre-shaped, tailored to fit you when in position on the bike, follows your movements without restricting. ATTENTION: It is important to choose your correct size. Your intermediate_s7 must contour to your body. When standing upright it will feel "weird," but drop into the cycling position and feel the intermediate click on - perfect! Assos Mille fit apparel is tailored to suit the more robust, regular fit athletic body type. Like all Assos cycle clothing, each piece 'clicks' into position on the bike and follows your movements without restriction. Assos IJ.Intermediate Jacket is rated 1.0 out of 5 by 2.